Have you been to the dentist lately? If not, you should call Austell Dental Associates to schedule your next appointment! Whether you’re overdue for a routine cleaning and x-rays or are interested in learning more about a cosmetic procedure, we can provide you with exceptional service to improve the look and overall health of your teeth. Our office has received very positive reviews by past patients and we are in the Cigna PPO and Delta Dental Primer Policy. Request an appointment by filling out our online contact form. Located in Austell, GA, we proudly serve residents of Vinings! Many people are self-conscious about their smile because their teeth as not as white as they would like. This can be the result of prior root canal therapy, consuming coffee, tea, or tobacco products, or it’s simply the result of the aging process. At Austell Dental Associates, LLC our unique teeth whitening service is safe and effective, renewing the brightness of your smile for several years. 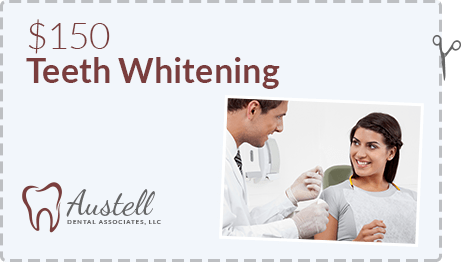 Our Vinings dentist can meet with you to evaluate whether whitening is a good solution and if you are a good candidate, the service is only $150! If you have lost teeth to decay or an accident, you may want to cover any gaps in your smile. Our team can determine if implants are a viable alternative. Implants do not decay, last for years, and look just like your natural teeth. Implants are great for replacing one tooth or as an anchor for a prosthesis replacing multiple teeth. Call us today to learn more! Austell Dental Associates, LLC has more than 50 years of experience serving the community’s needs. We understand seeing a dentist can be intimidating, which is why we maintain a friendly and warm environment for our patients. You can trust our Vinings dentist to work to improve your oral health and restore your confidence. Call (770) 467-3888 to schedule your appointment!